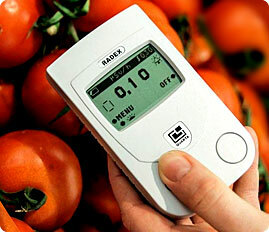 Home » Quarta news » Can you test food with a Geiger Counter? Testing food in general is one of the most common questions we receive and also happens to be one of the most difficult ones to answer. – Can food be tested with a hand-held Geiger Counter? Yes. – Will it detect elevated levels of radioactive materials, if present? Yes. – Is it absolutely safe to eat your fish after you scanned it and the result was negative? No, not necessarily. This is not a sensitivity issue, but is simply because radiation emitted from a tiny contaminant will be masked by the natural background radiation that’s all around us. Technically speaking, everything is radioactive, even we are. So it would be like looking for a specific water drop in a pond. If the natural background radiation around you is .10 uSv/h and contaminant in the fish emits .02 uSv/h, then geiger counter will naturally continue showing .10, because that’s how many radiation particles it is detecting in your immediate vicinity. This means that no matter how sensitive, expensive or calibrate your equipment is, the only way to be absolutely sure that food is safe would be to test it in a lab, where a piece of produce is placed inside a special lead capsule that isolates it completely from any background radiation. There is a lengthy scientific procedure of setting up such tests. Many manufacturers will claim that their detectors will work just as well, but as you can clearly tell, that is a marketing scheme. The only sure way of accurately testing food for radiation is in a lab. Period. Having said that, there are still ways to considerably improve your chances of detecting contamination. Here are some practical tips in getting the most out of your RADEX geiger counter. Whenever anything is measured for radiation, the mass / size of the object being scanned matters. Don’t try to detect radiation in a single berry, a mushroom or a cup of water. Unless these are highly contaminated, there would be few particle streams emanating from a smaller volume hence the chances of detection are that much lower. Instead, try scanning an entire basket-full of produce, or a tank of water – the number of particle sources would be that much greater and easier to detect. If it’s fish your are measuring, try to have as much of that tuna as possible. Turn the unit on and place it right next to the object (you can use a simple plastic bag to protect the unit – that won’t effect sensitivity) for about 40 seconds. Then move a few inches to the side, and so on: continue displacing the detector by the distance of its width every minute or so, moving alongside of the object being scanned. So basically from head to tail. That would give you the highest chances of detection. However, please keep in mind, that even if after scanning it this way, there is still a chance that it may contain radioactive elements that are above the permissible levels for digestion. This is why we NEVER recommend to use Geiger counters for food testing unless in dire situations. We hope this clarifies matter a bit.